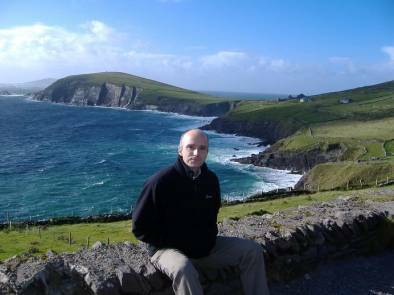 I was born in County Kerry in south-western Ireland. As an undergraduate, I studied mathematics at Trinity College Dublin , won a foundation scholarship in 1993 and graduated in 1995 with a first class honours degree and a college gold medal. In 1998, I completed the M.Sc degree by research in mathematics at Trinity College Dublin on the topic of group-invariant Hilbert spaces of analytic functions in several complex variables. The work of my masters thesis was carried out under the supervision of Dr. Richard Timoney. After spending some time working on software for satellite communications and data management in industry, and lecturing mathematics at the Institute of Technology, Tallaght, I commenced work on a Ph.D degree at the Hamilton Institute, National University of Ireland, Maynooth under the supervision of Professor Robert Shorten in 2001. I graduated with a Ph.D in 2004 and my thesis topic was the Lyapunov stability of switched linear systems. From 2004 to 2007 I was a member of the Systems Biology team at the Hamilton Institute. Currently, I am a faculty member and co-ordinator of graduate studies at the Hamilton Institute with particular responsibility for co-ordinating the graduate programme in network mathematics: a joint initiative with the CTVR in Trinity College, which has run each summer since 2008. Control subject to privacy constraints. Privacy and security for discrete event systems. Information diffusion and games on social networks. Distributed control of autonomous vehicle formations and string stability. Differential privacy and the L1 sensitivity of positive linear observers. A. Mc Glinchey and O. Mason, IFAC World Congress, 2017. Differential privacy in metric spaces: Numerical, categorical and functional data under the one roof N. Holohan, D. Leith and O. Mason, INFORMATION SCIENCES, 305: 256--268, 2015. Differentially Private Response Mechanisms on Categorical Data. N. Holohan, D. J. Leith, and O. Mason. Discrete Applied Mathematics, 211: 86--98, 2016. Persistence, periodicity and privacy for positive systems in epidemiology and elsewhere. O. Mason, A. McGlinchey and F. Wirth, In Proceedings of the 5th Symposium on Positive Systems, Lecture Notes in Control and Information Sciences, 471: 3--15, 2017. Extreme Points of the Local Differential Privacy Polytope. N. Holohan, D. Leith and O. Mason. Submitted to Linear Algebra and its Applications 2016. Information diffusion on the iterated local transitivity model of online social networks , Lucy Small and Oliver Mason, Discrete Applied Mathematics, to appear, 2013. Nash Equilibria for competitive information diffusion on trees , Lucy Small and Oliver Mason, Information Processing Letters, Volume 113, Issue 7, pp. 217--219, 2013. The analytic hierarchy process, max algebra and multi-objective optimisation , Buket Benek Gursoy, Oliver Mason and Sergei Sergeev, Linear Algebra and its Applications, Volume 438, Issue 7, pp. 2911--2928, 2013. Barabanov norms, Lipschitz continuity and monotonicity for the max algebraic joint spectral radius , Nicola Guglielmi, Oliver Mason and Fabian Wirth Submitted to Linear Algebra and its Applications, 2017. Spectral Properties of matrix polynomials over the max algebra, B. Benek Gursoy and O. Mason, Linear Algebra and its Applications, 435(7), pp. 1626-1636, 2011. P1-max and S-max properties and asymptotic stability in the max algebra, B. Benek Gursoy and O. Mason, Linear Algebra and its Applications, 435(5), pp. 1008-1018, 2011. Cyclic interconnection for formation control of 1-D vehicle strings. A. A. Peters, R. H. Middleton and O. Mason. European Journal of Control, 27:36--44, 2016. Leader tracking in homogeneous vehicle platoons with broadcast delays. A. A. Peters, R. H. Middleton and O. Mason. Automatica, 50(1):64--74, 2014. Diagonal Riccati Stability and the Hadamard Product , Alexander Aleksandrov, Oliver Mason, Anna Vorob'eva Submitted to Linear Algebra and its Applications, 2017. Diagonal Riccati Stability and Applications , Alexander Aleksandrov and Oliver Mason, Linear Algebra and its Applications, 492: 38--51, 2016. Absolute stability and Lyapunov-Krasovskii functionals for switched nonlinear systems with time-delay. Alexander Aleksandrov and Oliver Mason. Journal of the Franklin Institute, 351(8): 4381--4394, 2014. Diagonal Lyapunov-Krasovskii functionals for discrete-time positive systems with delay. Alexander Aleksandrov and Oliver Mason. Systems and Control Letters, 63(1):63--67, 2014. On delay-independent stability of a class of nonlinear positive time-delay systems. Vahid Bokharaie and Oliver Mason. IEEE Transactions on Automatic Control, 59(7):1974--1977, 2014. Stability criteria for sis epidemiological models under switching policies. M.A. Rami, V. S. Bokharaie, O. Mason and F. R. Wirth, Discrete and Continuous Dynamical Systems - Series B, 19(9):2865--2887, 2014. Diagonal Riccati Stability and Positive Time-Delay Systems , O. Mason, Systems and Control Letters, 61 (1). pp. 6-10, 2012. Stability and positivity of equilibria for subhomogeneous cooperative systems, V.S. Bokharaie, O. Mason and F. Wirth, Nonlinear Analysis:Theory Methods and Applications, 74(17), pp. 6416-6426, 2011. Switched linear systems and common quadratic Lyapunov functions; Seminar Series of the Mathematics Department, University of Limerick, October 2005. I was a member of the organising committee of the Hamilton Institute workshop on Nonnegative matrices in 2004 and again in 2008. I served on the organising committee of the 2006 International Workshop on Systems Biology and on the committee for the 2008 workshop. I act as a reviewer for the IEEE Transactions on Automatic Control, the IEEE Transactions on Circuits and Systems, SIAM Journal of Control and Optimization, SIAM Journal of Matrix Analysis and its Applications, Linear Algebra and its Applications, IET Systems Biology and Systems and Control Letters. I also write reviews for Mathematical Reviews. I was one of the principal organisers of the Hamilton Mathematics Challenge: an online maths contest for secondary school students.